Hot Chicks Dig Smart Men: Boogie Blogging Friday - Now with 100% More Snow! Today is the first snowfall of the season. Boogie loves snow. 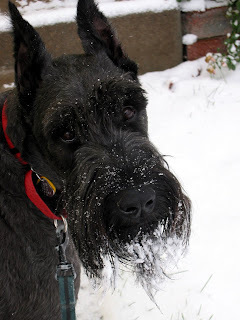 When his leg hair is longer, a romp through the snow usually results in golf ball-sized snowballs adhering to his legs, in addition to the gallons of snow he drags in every winter on his beard. 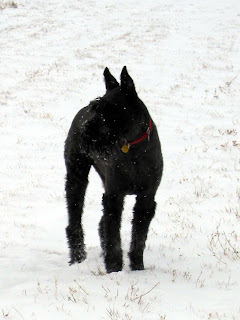 Now that he's an Older Dog, we were a bit concerned that the cold would prevent him from enjoying snowy walks, since he gets a bit stiff in the hips these days. But if today was any indication, he's ready for another season of fun. I love the face shot of him..such a handsome gentleman! Look at the snow! I am so jealous...we are still waiting...some of us more than others! He does have a cute face. Not that I'm biased or anything. Or soft. I love getting to see pics of Boogie, he's such a cutie. I have snow. But then it turns to rain. And then it turns to snow. But Boogie is a cutie, and photographs well. And only slightly off topic, cold is here, and your hat and scarf that I won is getting use. And getting some envy as well. Which makes them a perfect twofer: handmade comfy warmth and "ha ha they're mine and you can't have them" snobbishness. Who's a handsome Boogie? You are, yes you are! I love my kitties, but sometimes I miss having a doggie! He looks like he is totally enjoying himself in the newly white world. My doggies get snowballs on their pantaloons too, but at 10" shoulder height, there's a lot less of them to de-ice when they come back inside. Vince, I'm glad you're enjoying them. You and Michelle's Grandmom can compare notes, as I hear she absconded with Michelle's prize. Jeri, we've given up on the de-icing. We're just resigned to damp floors when there's snow outside. Thanks so much for having Boogie Blogging Friday to share your handsome fella with us!